I felt like giving up, but a stern Skype call put me and self-pity in its place – ‘get on with it’. Now OF COURSE it is embarrassing at a professional and even an organisational level to admit an inability to raise the necessary finance for Linden Lab land tier fees. And no, we have not asked for special treatment because we are African – most NGOs globally are having a tough time with fundraising and we are all in the same boat. And it would be irresponsible and short sighted to utilise funds from one project (read donor) to subsidise another. Social Cohesion. Kindness. Good-will. Sympathy. Call it by any name, it is still sweet and empowering: Two community builders and landowners offered to organise a benefit each. Another came back after two years to volunteer full-time inSL. A PHP coder headed our call for a special donation script and then waivered the fees. 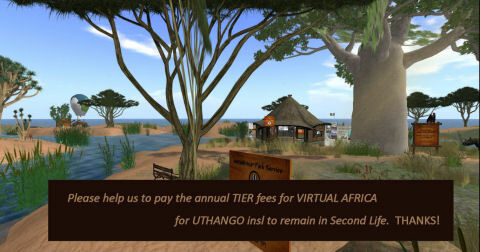 Some people donated directly to Wilberforce Rau (our record keeping avatar) and some tenants suggested we rezz a poster and tracker that could show the outstanding fees for the year, and did so at the Rangers’ Hut at Virtual Africa inSL (calculated at 885 USD for each full sim and 399 USD for each homestead), or 2568 USD for a period of six (6) months for the entire region of four sims – just about 705 000 Linden Dollars or 20 000 ZAR every six months, excluding connectivity, human resources and bandwidth costs (which is about four-times that amount). It remains more costly from Africa than from any other place on earth to be in a virtual world, resulting in less than 0.5% of a billion people accessing virtual technologies. “Social capital is defined by Robert D. Putnam as “the collective value of all social networks (who people know) and the inclinations that arise from these networks to do things for each other (norms of reciprocity)”. The idea and concept of ‘social capital‘ has been strongly introduced to academic circles in early 2000 and was adopted by the World Bank as an useful organising term for stakeholder influence on development. To bend all things of societal value to economic terminology like ‘capital’ is problematic in its own sense, but more about that another time. 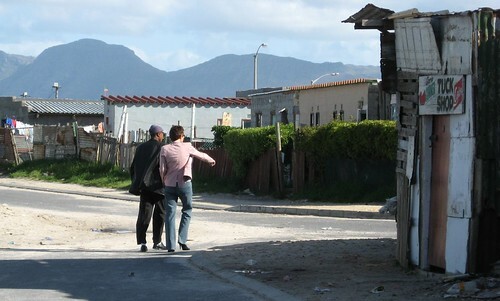 About the same time as when the term was being debated globally; in South Africa in 2001, the now leaders of our own development company (Uthango Social Investments) were building and embracing social capital practically as the engine of our development work in communities via the Uthango Micro-Enterprise project described here by Harvard University and linked to marginalised and very poor urban areas. Uthango designed a participative engagement instrument, called iPekx (Indigenous Peoples’ Knowledge Exchange) and linked the information directly to economic and societal development programmes – resulting in an award-winning approach to sustainable development. We now analysed what exactly happened and realised that our online community (especially in Second Life) is stronger in social capital than we realised and that – when informed openly about our reality – the community of affected people demonstrated both collective social cohesion and individual good-will leading to renewed community participation in our project. As a community in virtual worlds with an affinity for Africa we recognised we are facing collective challenges, expressing aspirations and values, as well as sharing the same space and having equal opportunities that result in a ‘sense of togetherness’ (a glue) – the fabric of healthy communities. As a development agency based in South Africa, that emerged from a local development project, the Uthango’s team intimately knows and understands the value of open conversation and social cohesion as enabler for change and creating healthy communities. There is no substitute for spending time with clients in pro-poor projects and building trust via listening and fostering long-term mutually beneficial relationships. Whereas physical capital refers to physical objects and human capital refers to the properties of individuals, social capital refers to connections among individuals – social networks and the norms of reciprocity and trustworthiness that arise from them. In that sense social capital is closely related to what some have called “civic virtue.” The difference is that “social capital” calls attention to the fact that civic virtue is most powerful when embedded in a sense network of reciprocal social relations. A society of many virtuous but isolated individuals is not necessarily rich in social capital. There is definitely scope to connect some ‘isolated individuals’ and smaller communities into a loop and strenghten our network. This will become more possible when we require the resources to spend more time in our virtual world’s projects, and build on educational, enterprise and entertainment initiatives. So, what exactly is SOCIAL CAPITAL? The very first definition that jumps from Google is also the one I like best: ‘social capital’ referred simply to “‘those tangible substances [that] count for most in the daily lives of people’ according to Lyda Judson Hanifan in 1916. He was particularly concerned with the important place of good will, fellowship and sympathy that make up a social unit and contribute to a meaningful life. Significantly almost a 100 years later, a study published by Dacher Keltner, director of the Berkeley Social Interaction Laboratory, suggests that human beings are genetically ‘wired’ to be good and he (too) places KINDNESS towards others central as prerequisite for a meaningful and successful life. The corresponding article, “Forget Survival of the Fittest: It is Kindness that Counts” suggests that giving and gratitude relate to lasting wellness and a better society. If the impromptu exchange of KINDNESS is an indicator of the existance of social capital, then Virtual Africa inSL has growing social capital based on our experience of kindness. The concept of social capital implies that face-to-face encounters and shared experiences are needed to build trust and community. Ages ago a ‘community’ with social capital would be defined around the physical place where people live – a village or hamlet, where they share daily life. Nowadays the definition is much broader and rather refers to the space (even virtual) where people have a sense of belonging. Or is it a matter of virtual places that provide the same medieval sense of being present in the same place to grow and participate as community?